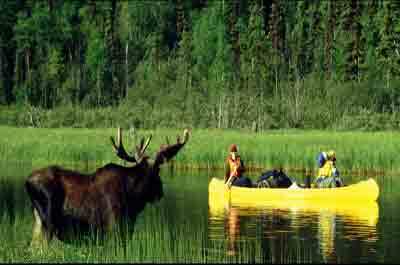 Discover the top North America canoe trips with some scenic wilderness adventure that is gentle enough for beginners and a challenge for experts.. 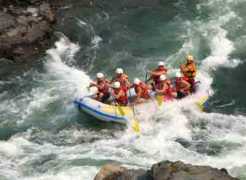 The best scenic North America canoe trips include trips to the upper reaches of Canada and Alaska where you can experience snow capped mountains, grizzly bears, and moose, and the western USA, with beautiful mountain scenery and wildlife, and further down to the southern USA with a calm scenic trip to a swamp. 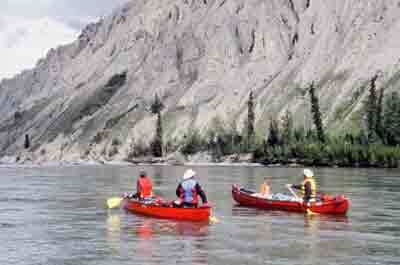 This river meanders at a relaxed paced to reflect on the Yukon's awesome scenery. The Yukon River is fourth longest river in North America is the river with the longest salmon run in the world and was a waterway route to the world famous Klondike Gold Rush. Over half of the river lies in Alaska with the other segment of the river near the source located in British Columbia. 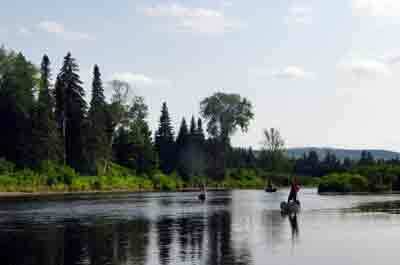 The Pelly River is fast flowing but manageable for most paddlers. 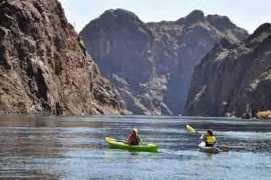 The Green River is one of the most fabulous, scenic calm canoe trips in the American West. 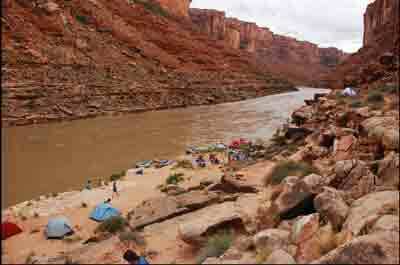 The Green river runs through Stillwater Canyon in Utah's famous Canyon lands country. The trip is great for families and memory-building and for those looking to enjoy evenings camping on the river shore after long day canoeing on a calm stretch of river. This beautiful river meanders through Canyon lands National Park and ultimately connecting with the Colorado River. The scenic beauty includes red rock formations, ruins, and rock art sites of Ancient Pueblo Indians. This is a flat water river in a very remote part of the southwest. The Bog River is a good flat river created by two dams that offer a gentle paddling route without white water and further enjoyed by a ban on motorboats. There are 14.5 miles of relatively calm waters with portage area. This scenic trip features many beaver dams around High Falls, and the many large nesting loons. 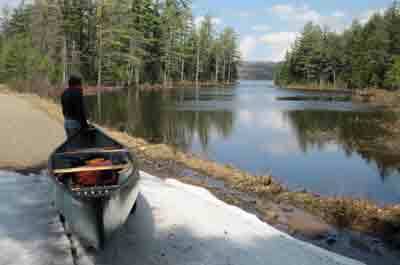 Primary access to the area is near Tupper Lake from a short gravel road off State Route 421 to Lows Lower Dam, where a canoe may be launched. Another canoe access point is available at Horseshoe Lake. Campsites are available. This 5 room motel is locate next to Tupper Lake with beautiful views of the mountains and sunsets. A great place for a family vacation. 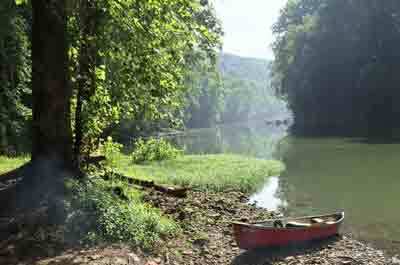 Canoe the scenic Green River though the Mammoth Cave National Park on trips ranging from just 3 hours to 2 nights or more! You see miles of bluffs and nature including turkey, deer, beaver, birds and reptiles as you make your journey downstream. This is cave country, and at least two caves can be scouted at water's edge. Canoe camping is allowed throughout the park. This 32 room motel is a good place a peaceful stay over to enjoy the attractions in the park. The Okefenokee Swamp in Southern Georgia is pristine, wild, and very soggy. It is made up of prairie, cypress forest, and scrub-shrub. A canoe trip through the Okefenokee will bring you to see huge osprey, herons, egrets and alligators, white-tailed deer, and turtles. The Okefenokee is the slow-moving headwaters of the Suwannee and St. Marys Rivers. 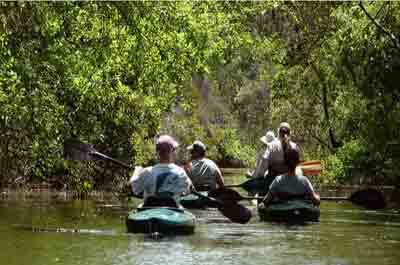 Winter time can be an ideal time to canoe the Okefenokee. Though nights can get cold, sometimes in the 30s, the days can warm up to to 70 degrees, compared to the late Spring, summer and early fall months you are apt to experience 90 plus degree days with stifling humidity. A Campground close to the Okefenokee Swamp.